I’m working on a new piece for Cheongju Craft Biennale, opening on September 13th in South Korea. Here’s the documentation of the project and insights on the journey. My practice as an artist involves spending a large part of my life sitting at a desk, starring at a computer screen, and as much as I love my work, it’s not necessarily pleasant. Forcing myself outside cities tends to brings some sort of counterbalance to this weird lifestyle, so I’m taking the habit to regularly escape the city/desk/computer scenario and I often find myself in remote locations. After landing in Seoul, I headed South East and found my way to Sobaeksan National Park, to spent a day going up Birobong, a 1439m peak. In order to better understand these landscapes, I recreate elevations with software. Create a flat grid, elevate the points on the Y axis. Increase the resolution of the grid for higher level of details. Load a texture, use the brightness of each pixel to move each point. Here’s a Cinema4D source file (R16+) that reveals the process. I worked with noises for a couple of years, always fascinated by generative textures, and how a few lines of code would create such intricate and interesting forms (see the landforms prints). More recently, I used 2 softwares dedicated to the generation of realistic heightmaps: World machine and World creator, I recommend experimenting with both. In these attempts at capturing my experience of nature, I made hundreds of drawings depicting reliefs. I’m not very agile nor precise with my hands, so I use a plotter, a small robot holding a pen and who can trace lines on paper, 24/7, without showing signs of exhaustion. It’s an extension of my arm, it executes my ideas while I’m preparing the next ones. 3- Romantic paintings and landscapes. Bierstadt and the Hudson River School style. – The dark, heavy, dramatic and sharp scenes of Gustave Doré (1832-1883), engraved in wood and drowned in ink. – The calm, foggy and haunting horizons of Caspar David Friedrich (1774 -1840) announcing the dusk of a civilization. – The colorful and violent skies, blurred seashores of William Turner (1775-1851). Emotions took over everything. The romantic paintings all depicts the immense forces shaping the earth, suggests contemplation of nature, and insist on the insignificance of human figures. I was recently introduced my to Albert Bierstadt (1830-1902) and the « Hudson river school style » and I quickly found my self standing in front of one of its largest canvas at the Seattle Art museum. The paintings feel bright, aerial, it suggests hope, a peaceful glorious present, abundant beauty past the foggy horizons. It depicts the sublime through light, gold, transparency, soft shades, radiant light rays thought vibrant haze and sprayed waves. Even the heavy clouds contribute to the perfectly lit scene by casting rays and toning the composition more than they announce the dangerous storm to come. « Puget Sound on the Pacific Coast” (1970) by Albert Bierstadt. Currently at the Seattle Art museum. 4- Softwares, plugins, GPUs, brushes of the modern painter. The discovery of Bierstadt‘s body of work produced such enthusiasm that it threw me off my monochromatic confort zone. It brought colored rays of light and blew some foggy wind and dense clouds into my landscapes compositions. I’m not an artist of colours. I tend to focus more on structures and forms, the shell before it’s texture. In this case, the addition of colored light and atmosphere actually helps structuring the composition: revealing or hiding parts of the topography, amplifying the depth of a valley or compressing a perspective with heavy shadows. I still used monochromatic landscapes, and color tones natural light, from dark orange to blue. All perceived color comes from the light sources and is emitted, while the subject remains color neutral, and reflects and diffracts the tones it receives, as opposed to Bierstadt and traditional romantic paintings. The images below depict generative terrains, rendered in 3D with octane. 5- Panorama, a popular spectacle in the mid-19th century. 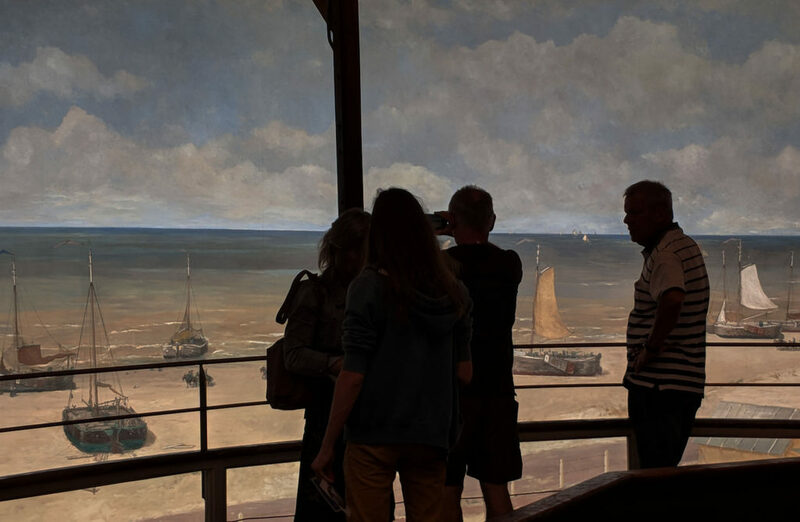 Le Panorama Mesdag, peint par Hendrik Willem Mesdag en 1880-1881, est une peinture cylindrique de plus de 14 mètres de haut, 40 mètres de diamètre et 120 mètres de circonférence, conservée dans un édifice éponyme à La Haye aux Pays-Bas. 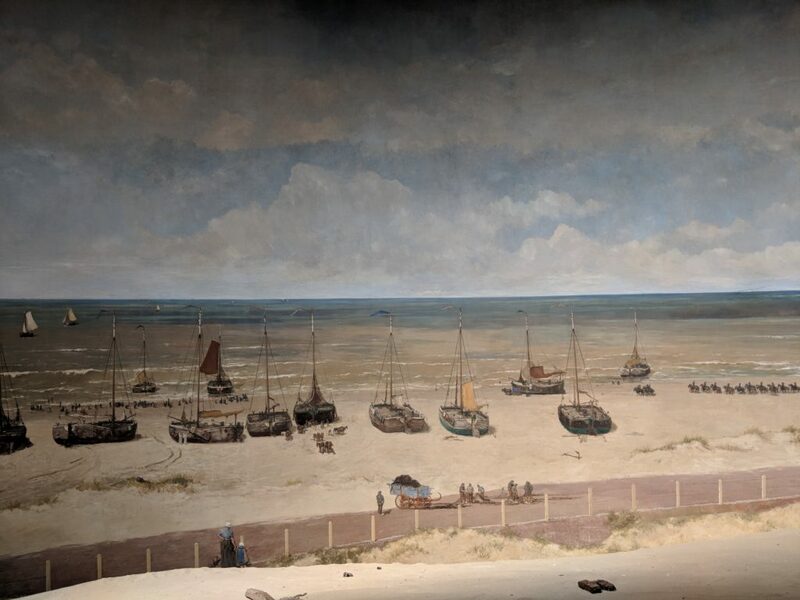 Mesdag était un peintre de marine réputé appartenant à l’École de la Haye. 6- Paper, Glue, Ladder. bringing the virtual into the real. 7- Projection mapping. pixels calibration and maintenance delights. 8- Cheongju Craft Biennale, South Korea.